Elizabeth Bomberg reflects on the ‘Sustainable Materialism Workshop’, which examined emerging social movements in sustainability and the shifting nature of environmental practices and advocacy. Thanks to a collaboration fund between the Universities of Sydney and Edinburgh, sponsored by the Partnership Collaboration Awards Programme, our two associated institutes (Sydney Environment Institute and Edinburgh’s Global Environment and Society Academy) were able to host an excellent workshop this summer on ‘Sustainable Materialism.’ Our focus was on flows of materials (including food, energy, clothing), through our everyday lives and if/how these flows and practices represent a new type of environmentalism. The delegates gathered at the Edinburgh Centre for Carbon Innovation (ECCI) in Edinburgh were amazingly diverse, representing disciplines of politics, environmental science, ecology, law, arts, architecture, literature, music, economics, sociology and more. Eleven papers analysed the people and groups engaged in environmental practices – food movements, community energy, sustainable crafting and fashion – and explored their motivations, forms, diversity and impact on social change. The publication of the Scottish Government’s Draft Climate Change Plan is another stark reminder of the scale and pace of change that is needed to be in with a chance of mitigating the most dangerous effects of climate change. The draft sets out ambitions for carbon emissions reductions in the domestic and service sectors of 75% and 98% respectively. This means significant reductions in energy demand through building fabric energy efficiency measures, behaviour change as we use the buildings, and a switch to low carbon heat supply away from fossil fuel based natural gas and oil heating systems. Government policy and regulations are going to play a critical role in driving this unprecedented level of change in the next 15 years. But the scale of change needed means we are unlikely to establish an interconnected suite of new regulations, standards, funding, financing, incentives, alongside supportive local and national governance structures, and get it right first time. We need to establish a constructive dialogue between local governments, the public sector, businesses and community organisations, that enables new approaches to be trialled – and sometimes to fail – without derailing the whole programme. The politics of being in government mean that experimental approaches to developing new policy measures are susceptible to harsh critiques by opponents, resulting in loss of ‘political capital’ for incumbents and a correspondingly risk averse approach by officials. After the demise of the Green Deal at the UK level, post-mortems have highlighted the challenging political context that meant that “failure was not politically conceivable” (Rosenow & Eyre, 2016). Despite early evidence pointing to issues with the programme design, the political context did not allow space for adjusting problematic areas and subjecting proposals to a ‘reality check’. By 2015, when the programme was eventually abandoned, the average delivery rate for loft insulation had dropped by 90%, cavity wall insulation by 62%, and solid wall insulation by 57%, compared to 2012 when the programme was launched (Rosenow & Sagar, 2015). This experience highlighted the importance of creating space for constructive dialogue and reflection as policies are developed. Perceived failure of one programme should not mean the end of a whole policy agenda, but present UK Government action for energy efficient buildings is stalling. It is great to see that the Scottish Government are not repeating these mistakes during the development of their ‘cornerstone’ policy – Scotland’s Energy Efficiency Programme (SEEP). They have already embedded a process for learning into policy development through supporting local pilot projects and embedding evaluation as an integral part of the projects and on-going delivery. As the academic research team supporting the evaluation of the local SEEP pilots, we have a responsibility to contribute to establishing a constructive dialogue around the national development of SEEP. Research evaluation of such programmes is potentially influential in determining what is understood to be ‘successful’ more generally. However, choosing the criteria for robust evaluation is challenging given the diverse geographies and socio-economic circumstances within which programmes take place, alongside the differing contexts of skills and supply chains. There are currently 10 local authority-led pilots taking place across Scotland, with a further round of applications under consideration for a second phase of projects to be announced this summer. As an evaluation team, we work collaboratively with both the local authority pilot leads and Scottish Government officials to understand their objectives and concerns during pilot design and delivery, and to determine the important dimensions of the local project from the local and national perspectives. This approach has highlighted common challenges and best practice, as well as areas where there is a need to gain more experience, such as approaches to targeting the commercial sector, or mixed-ownership tenement buildings. As the number of pilot projects grows, local authorities are taking on an increasingly proactive role in shaping the evaluation process. This ensures that the evaluation speaks to the local context and plays a development role to support future programme delivery, as well as informing national policy design. This use of evaluation within policy development is one way to provide a framework for constructive dialogue around the hardest delivery challenges we face in SEEP. It creates a formalised and evidence based way for local experiences to inform national policy design – rather than a blame culture where failed projects are seen only as a result of poor management and a waste of squeezed public resources. But this won’t be enough on its own to create the political space for tackling the hardest delivery challenges for SEEP. Programmes that take on these hard issues will need political back-up from local and national politicians and senior officials, they will need time and space to develop and refine approaches, and they will need flexible resource allocation that can be shifted around different tasks and over time. A strong working relationship based upon trust and respect between national and local governments is critical here. We hope that this culture can build over time to empower the officials and politicians supporting it to tackle the hard challenges posed for SEEP. The SEEP pilot evaluation interim report (published May 2017) is now available on the Scottish Government’s website. Over the years, we’ve witnessed a transformation in the regulation of energy consumption in the housing market. In this period I designed and delivered a series of low carbon homes and now reflect that we must be careful what we wish for. Governments have an obligation to deliver on agreed national and transnational targets and in Scotland a vehicle for this has been the various iterations of The Sullivan Report. In its current guise its ambition is to enforce ’nearly zero new buildings’ by 2019. In theory, this seems inherently virtuous but in practice can deliver new housing stock in danger of being neither energy efficient nor fully fit for habitation. The nub of the problem lies in the nature of the construction industry. Achieving a quantitative standard requires careful design and obsessive quality control. This is possible in bespoke operations or sophisticated manufacturing techniques but neither of these traits are characteristics familiar to the UK construction industry. To achieve air tightness approaching passive house standards requires a level of fit otherwise reserved for the car industry. [fig.1] Passive house is an achievable but inherently fragile standard. 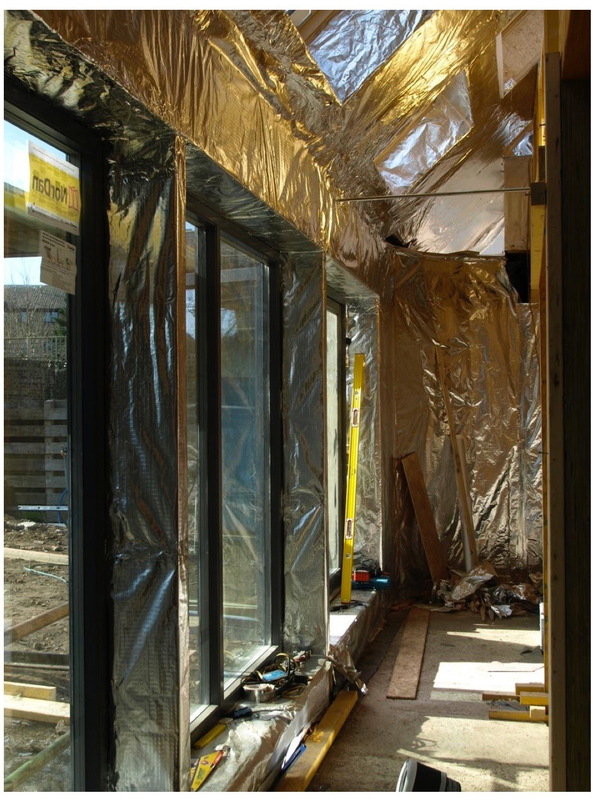 As of now, the national baseline for air tightness is around 5 times less onerous than the passive house standard, but past experience suggests a progressive uplift over time to deliver the promises of Sullivan. Over forty years, insulation standards have increased five-fold with little in the way of adverse effects for the householder. Seeking to replicate this process for air tightness will be more troublesome. 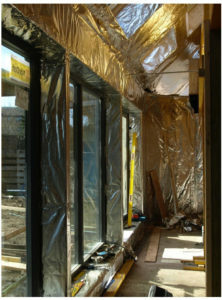 Increasing air tightness can degrade air quality in our homes. 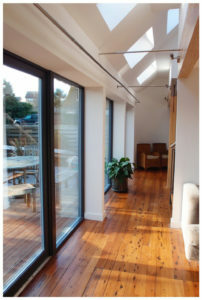 Recent research shows that current standards for air tightness without effective mechanical ventilation either put occupants’ health at risk or make a mockery of energy conservation in the heating season through intermittent episodes of uncontrolled exfiltration (otherwise known as opening windows) . 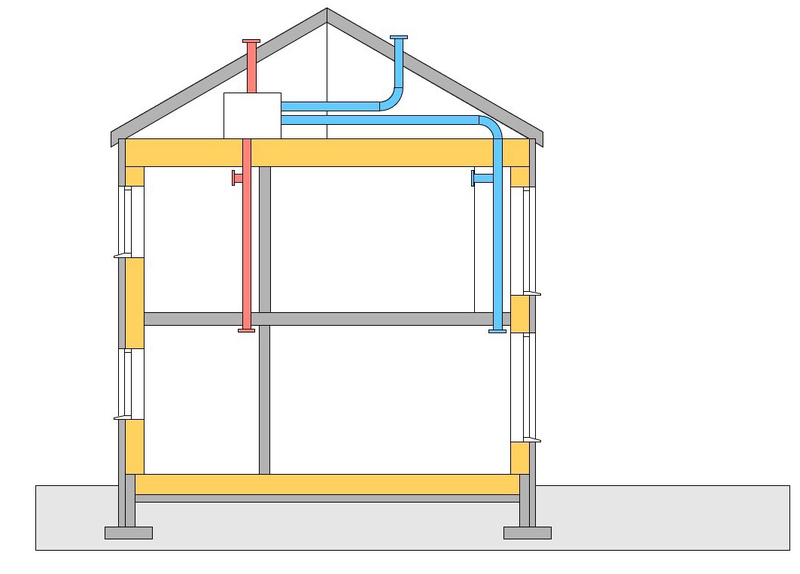 However as passive house has gifted the means to define clear air tightness targets to our regulators, the likelihood is that the baseline standard will become progressively more onerous. Exclusive Mode buildings operate through separation of internal and external environmental conditions and regulation of thermal comfort is through mechanical means. 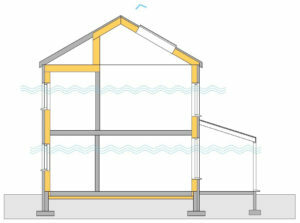 Except in relation to collecting solar gain, Passive Houses are Exclusive Mode buildings. On the face of it, housing standards that reduce heating demand to a negligible level are praiseworthy. However, it comes with a susceptibility to poor air quality and dependency on mechanical plant, all of which delivered by industry with an entrenched inability to deliver decent levels of fit and finish. Selective Mode building accepts that from time to time, heating and cooling is required to maintain comfort. In this context, the question is then to consider those forms of generation that are most benign in their impact. I would suggest it is inadvisable for building regulation to focus on ever higher standards of air tightness as a means to progressively reduce heating demand in our homes. To use a medical analogy, such medication can be accompanied by unpleasant side effects. Our legislators should continue to recognise that renewable energy only plays a part in reducing our carbon footprint, but also is more likely to keep our households healthy. We don’t usually value our homes in terms of their measurable performance. Some of us enjoy the comfort, control and running costs that come with a finely calibrated passive house which embodies the best of the exclusive tradition in environmental design. Many others wish to have homes that have greater freedom in their design, a closer relationship to external worlds and the ability to stand up to robust treatment by the householder. These are the key characteristics of the selective tradition and ideally, both selective and exclusive modes should be accommodated for by our regulators. It may seem counter intuitive, but now I tend not to define the benefits of renewable energy technologies in terms of resource use and carbon impact. Instead, we should advocate their use to enable healthy, forgiving and long-lasting homes that help us all along the way to having the freedom to live as each of us wish. Howieson, S.G., Sharpe, T. & Farren, P., 2014. Building tight – ventilating right? 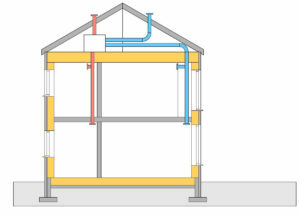 How are new air tightness standards affecting indoor air quality in dwellings? Building Services Engineering Research & Technology, 35(5), pp.475–487. Hawkes, D., McDonald, J. & Steemers, K., 2002. The Selective Environment, London: Spon Press. According to some accounts the British housing stock is the oldest in Europe (Economidou et al., 2011). Due to low levels of construction and demolition, Britain is likely to be near the top of the European table for many years to come, with suggestions that around 70-80% of the buildings that will be in existence in 2050, are already standing (Royal Academy of Engineers, 2010). It is also estimated that around 90% of the average modern life is spent indoors (Klepeis et al., 2001). How our indoor environments are designed and constructed, therefore, has an inevitable impact on many different aspects of our lives. The majority of British homes were built before the introduction of energy performance regulation, and partly as a result of this, they are notoriously leaky and energy inefficient. Energy use in our buildings – electricity use as well as gas, oil and solid fuels for heat – is currently responsible for about a quarter of Britain’s territorial carbon emissions. Legally binding climate change targets mean that by 2050 energy use in our homes is expected to be responsible for roughly none of our carbon emissions. Alongside climate change, the affordability of energy, and the concept of fuel poverty, have emerged as issues of political and social significance in recent years. The aged, leaky nature of UK housing is highlighted as one of the primary (if not the primary) causes of the problem. The difficulty in keeping our homes warm is also held partially responsible for various public health problems, both physical – respiratory, rheumatic – and mental – anxiety, depression. Strikingly, the UK has one of the highest rates Excess Winter Deaths (the phenomenon of more people dying in Winter than at other times of the year) in Europe, with the state of the British homes and the difficulty in keeping them warm, considered one of the principle factors for this (Liddell et al., 2015; Marmot Review Team, 2011). With our current housing stock inevitably going to be with us for some time and the issues of climate change, fuel poverty and public health and housing on the political agenda (at least at times…) the question emerges of what, if anything, can we do to alter our inhabited spaces, and make them more energy efficient. It is generally agreed that it is more cost and energy-effective to try and energy efficiently retrofit even the oldest, leakiest homes than to knock them down and build new ones (Power, 2011). Walls can be externally and/or internally insulated, windows can be replaced with more air-tight frames, and/or double or triple glazing panes, and EU appliance regulations have continually improved the efficiency of electrical and heating appliances. 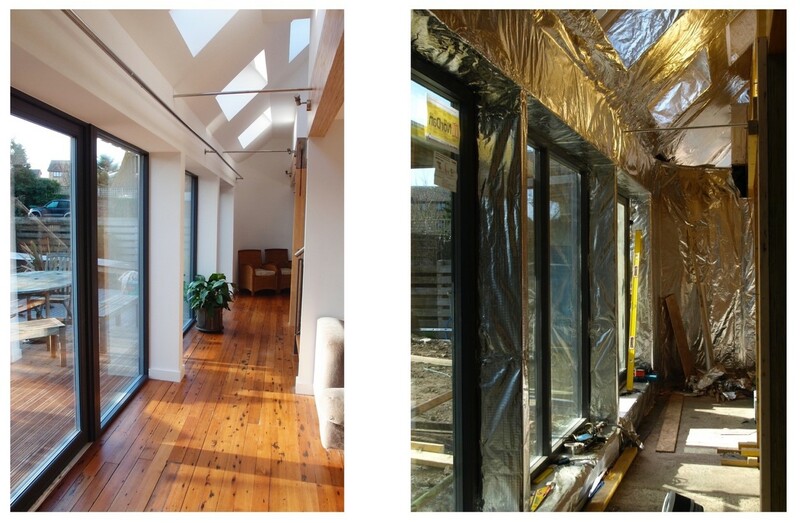 In the retrofit industry certain retrofit options are considered as ‘low hanging fruit’, as they are relatively easy to install, relatively inexpensive and capable of saving substantial quantities of energy. Many homes in Britain will have, in recent years, had their loft insulated, any empty cavity walls filled with insulation, and/or a more efficient condensing boiler replace their previous heating system. Rates of implementation for these low hanging options have increased significantly in the last 10-15 years. Due to the social benefits – lower carbon emissions, more affordable energy services – these increases have generally been driven by government support schemes, with the costs of additive measures like insulation, often either partly or completely subsidised by government, and the introduction of replacement measures, like boilers and appliances, supported via mandatory government efficiency regulations. Numerous opportunities to retrofit British homes remain, with the potential to further address government social policy targets. As the easiest and most cost effective retrofit measures are often implemented as a priority, the options for retrofit that remain will, however, become progressively more expensive and more difficult to implement. Retrofit (and energy efficiency more generally) is increasingly marketed as an activity that has ‘multiple benefits’ for both governments and for households (IEA, 2014). Governments are enticed to further support retrofit with the suggestion that it is not only socially beneficial – addressing climate change and fuel poverty – but that it also has economic benefits. More money spent on retrofit means less money spent on energy – investment rather than consumption spending. It is argued that this change in spending patterns will result in higher tax intake for government via higher net levels of employment (UKERC, 2014) and improved fiscal returns (Washan et al., 2014). While there is a case for government spending on retrofit there is also a case for private households to invest without government support. Perversely the private case for retrofit has historically been considered to focus on the economic calculation of whether the investment in retrofit will offer enough of a reduction in energy bills to offer a payback. Current research suggests that to convince households to retrofit, the less quantifiable benefits, such as improvements in comfort, should be highlighted more clearly. It is also argued that retrofit should not be considered as distinct from general home improvements, as it is much more often than not carried out alongside general renovations (UKERC, 2013). Packaging retrofit measures into the installation of new kitchens and bathrooms is seen as an effective way of making homes more energy efficient. While altering our homes to make them more energy efficient has clear benefits there are limits to how much can be done. Much of the older stock is revered for its architecture and its cultural significance, with the system of ‘listing’ buildings for protection seeing over half a million buildings with major restrictions placed on any alterations and significant retrofit probably out of the question (Brightman, 2012). While our older buildings create problems due to the difficulty in heating them, our younger buildings are far from perfect. The average floor space in newly built properties has generally fallen throughout the 20th century, with UK homes now considered on average to be the smallest in Europe (Morgan and Cruickshank, 2014). These smaller spaces are thought to be detrimental to inhabitant’s mental health, with the British public generally considering older British homes much more desirable than new ones, partly because of their space, their adaptability and their perceived cultural value (RIBA, 2012). Whilst, as highlighted, there are many different reasons for retrofitting our existing homes both for the inhabitants and for the government, the pre-eminent driving force behind action is arguably climate change. Ultimately, climate change targets will mean that the supply of energy to our homes must result in low to zero carbon emissions. With the perceived multiple benefits of energy efficient retrofit and the low base of efficiency from which our homes are starting there are still many retrofit opportunities and many reasons to try and implement these. If the low carbon targets are to be achieved however, the issue of how much time, energy and investment that is put into improving energy efficiency as opposed to thinking about how we decarbonise our remaining supply requirement, will be a complex and contentious issue. Economidou, M., Laustsen, J., Ruyssevelt, P., Staniaszek, D., 2011. Europe’s Buildings Under the Microscope: a country by country review of the energy performance of buildings. IEA, 2014. Capturing the Multiple Benefits of Energy Efficiency Capturing the Multiple Benefits of Energy Efficiency. Klepeis, N.E., Nelson, W.C., Ott, W.R., Robinson, J.P., Switzer, P., 2001. The National Human Activity Pattern Survey (NHAPS) A Resource for Assessing Exposure to Environmental Pollutants. Power, A., 2011. Housing and Sustainability: deomolition or refurbishment. Urban Des. Plan. 163. RIBA, 2012. Future Homes Commission – Building the Homes and communities britain needs. Royal Academy of Engineers, 2010. Engineering a low carbon built environment: The discipline of Building Engineering Physics. UKERC, 2014. Low carbon jobs: The evidence for net job creation from policy support for energy efficiency and renewable energy. UKERC, 2013. Understanding Homeowners ’ Renovation Decisions : Findings of the VERD Project. Washan, P., Stenning, J., Goodman, M., 2014. Building the Future: The economic and fiscal impacts of making homes energy efficient. Mags Tingey, Dave Hawkey, Ruth Bush and Jan Webb – Heat and the City Team researchers (University of Edinburgh), give their views on the Consultation on Heat & Energy Efficiency Strategies, and Regulation of District Heating. We’ve been researching sustainable heat and local energy systems in Europe for eight years. As social science researchers, we strive to develop an objective view point, using evidence to inform our statements. Our data is derived from expert interviews, social surveys, ethnography and documentary analysis; hence we work closely with practitioners from across Scotland and the UK, as well as Denmark and Germany. Over the years, this has helped us gain a relatively well informed understanding on peoples’ thinking in the sector. But when we were asked by Scottish Government to facilitate two consultation events around an area of policy so close to our research, we were intrigued to see how energy practitioners from across Scotland would react to these new, and potentially radical, proposals. Our role in organising the consultation events continues our contribution to developing the proposed policy and regulatory framework. We have been members of the successive working groups and expert commissions which have fed in to the development of Scottish heat policy and the content of the consultation document. We also convened a series of workshops for the Scottish Heat Network Partnership (HNP) Practitioner Group between 2014 and 2016 on behalf of Scottish Government. Both of these areas would be significant new developments for Scottish Government and Local Authorities. The proposals build on a number of policy developments, notably, Scotland’s new Energy Strategy – one of the 3 themes is ‘a smarter model of local energy provision’ (Scottish Government 2017). In addition, in 2015 energy efficiency was declared a National Infrastructure Priority in Scotland, the related Scottish Government Heat Policy Statement was published, and Scotland’s Energy Efficiency Programme was announced (Scottish Government, 2015). In this blog we talk about views on the proposal for a statutory duty to be placed on local authorities to develop local heat and energy efficiency strategies. Should a statutory duty be placed on Scottish local authorities to develop and implement local heat & energy efficiency strategies? Some local authorities have already developed sustainable energy action plans for their areas. New statutory plans however, would likely involve more direct participation of Scottish government (for example, in setting out common socio-economic assessment methodologies to be used). The consultation also suggests that such strategies could identify zones within which support for specific low carbon heat technologies would be targeted. Most consultation participants saw this proposal as something of a natural step for local authorities to be tasked with a role in planning and implementing area-based heat decarbonisation and energy efficiency. Existing climate and housing duties mean most local authorities have already done some relevant work. The Climate Change Act 2009 for instance, places duties of Scottish public bodies to contribute to emissions reduction targets. Local authorities also have a longer history of energy efficiency interventions, dating back at least to the Home Energy Conservation Act in the 1990s. More recently they’ve been involved in delivery of area-based Scottish housing energy efficiency programmes. Equally Scottish local authorities are responsible for housing strategies, planning, economic development, and many have significant estates. All of these interact with energy infrastructure and carbon emissions at locality scale, especially in buildings and transport. The most appropriate scale at which plans should be developed. Should they be produced by every local authority, or at regional scale with local authorities working together? Most participants suggested it would not be the most efficient use of resources to develop one strategy for every one of the 32 local authorities. But no clear consensus emerged around an alternative model. Some looked to regional approaches, while there was also interest in a publicly owned Scottish Energy Company, mooted in the main Energy Strategy consultation document , as a vehicle for developing and implementing strategies. The questions intersect with questions of resourcing, support, skills and expertise which were raised by many. Balancing heat decarbonisation on the one hand and energy efficiency on the other. Should the eventual policy prioritise integrated local heat and energy efficiency, with both aspects considered together? Or should there be a greater focus on energy efficiency than heat decarbonisation? There were views in support of both approaches. Some participants identified a conflict between ending fuel poverty and meeting decarbonisation How will both objectives be met when natural gas is calculated to be cheaper than renewable sources of heat but is not lowest carbon? Other participants focussed on what they identified as a related conflict between developing area based solutions and targeting fuel poverty. Will it prove difficult to link an area based scheme with other domestic (non fuel poor), and non-domestic, buildings in an area based approach? Whatever participants’ views on the detail of local strategic planning, it was seen as critical, alongside district heating regulation, to meeting both Scotland’s new energy strategy and climate change targets. Local energy planning and district heating regulation have both been key to development in other European countries including Denmark, Norway and Sweden. In Scotland public debate on these issues has so far been within distinct cross-sector interest groups. And whilst there seems to be an emerging consensus on many fundamental points in the consultation across energy, housing and public service practitioners in Scotland, what about civil society? Many communities of practice, and communities of place, (think small business owners, major local employers, local homeowners and renters, students, educators…the list goes on), surely will also need the opportunity to be involved in a public debate? The potential gains are high – with more affordable and sustainable energy for households, businesses and public sector. In the words of Tom Burns, first Professor of Sociology at Edinburgh University, “It is the business of sociologists to conduct a critical debate with the public about its equipment of social institutions” (Burns’ 1965 Inaugural Lecture Sociological Explanation). Taking heed of Burns means taking seriously that these discussions go beyond distinct cross-sector interest groups, and that an informed public debate is developed. Some of the proposals discussed within the consultation represent a significant change from the status quo. How would people feel about local and national governments taking a more proactive role in energy provision and efficiency within buildings? The draft Climate Change Plan proposes ambitious targets for low carbon heat (by 2032, 80% of domestic heat and 94% of services). Achieving these may involve far more disruption to daily life than the decarbonisation of electricity has so far. Such innovation is likely to require far more extensive public debate to build enduring support for interventions. Local heat and energy efficiency strategies could be a vehicle for that debate if structured appropriately. It is difficult to draw conclusions on the eventual form of policy, legislation and regulation. Not only is Scottish Government at a ‘policy scoping’ stage, but there will also be views submitted to the consultation that were not represented at the events we ran. Further consultations and proposals will address the detail, so if you missed the 18th April deadline, there will be plenty of opportunity to contribute. Feedback from the events will be published with the Scottish Government response to the consultation. Professor Jan Webb served as a member of the Short life Working Group on Regulation of District Heating, technical adviser to the Special Working Group on Regulation, and member of the Expert Commission on District Heating and DH Loan Fund Advisory Panel. 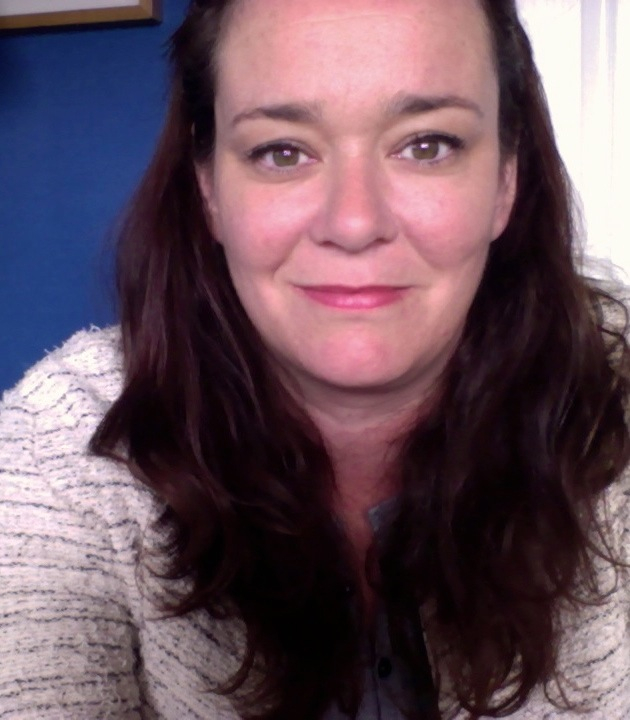 Dr Ruth Bush served as a technical advisor to the Special Working Group on Regulation and is now postdoctoral research fellow evaluating Scotland’s Energy Efficiency pilot Programme. Dr Dave Hawkey served as facilitator for the Short life Working Group on Regulation of District Heating and co-convenor of the Scottish Heat Network Partnership (HNP) Practitioner Group. He was recently interviewed on You and Yours BBC radio 4 programme about district heating regulation and consumer protection. Listen to the broadcast on 28 April here . 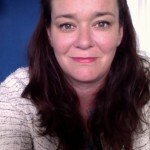 Ms Mags Tingey served as co-convenor of the Scottish Heat Network Partnership (HNP) Practitioner Group. Systems modelling has played an important role in the development of the Scottish Government’s draft Climate Change Plan and Energy Strategy, and is seen by the policymakers in Scotland as key enabler of its vision for policy integration. The kind of modelling adopted in Scotland has been used by many national governments, advisory bodies and international agencies in formulating response to energy policy challenges, especially climate change. Despite their widespread use, however, there are some basic analytic and pragmatic concerns, as Dr Chris Dent explores. This is probably the most famous quotation about statistics (which might demonstrate that there is no such thing as a famous quotation about statistics). Box meant by this simply that that no model represents the world perfectly, or provides outputs which are the whole truth about the world – one needs therefore to identify carefully the purposes for which a given model is useful and those for which it is not. My overall thesis is thus that it is necessary when carrying out an applied modelling study to provide a clear statement about what the model is claimed to tell us regarding the real world, along with a logical argument to support that statement. This statement, from a prominent researcher on the boundary of energy systems and operational research, summarises well a key issue in quantitative modelling. When it is necessary to take a decision involving a complex real world system, in order for a modelling study to have credibility for decision support, the model must sometimes be correspondingly complex – for instance detail of power generation operation or investment decisions depends on detail of the network as well as on the generation options alone. However, it can then be hard to understand how inputs and modelling assumptions feed through into model outputs. On the other hand, while it is clearly easier to understand what features of data and assumptions are driving the results of simpler models, one must ensure that insights gained about the model are relevant to the real world rather than only being relevant to the model. This brings to mind the quote attributed (possibly incorrectly) to Einstein that “Everything should be made as simple as possible, but not simpler”. It remains the case, however, that for any model (simple or complex) a key part of making it useful (in Box’s term) is an honest assessment of its capabilities. This, to me, leads to several key issues. The nature of applied modelling. I would argue that any applied modelling study must be aiming to predict some feature of the real world – otherwise how can the study be called applied, or be of any use in supporting decision making? The word ‘predict’ is used here in a very general sense – for instance it might be about understanding at a qualitative level what the key issues are in determining a given real world outcome, or about reconstructing historic events at times or places where observations are not available. It is also important to recognise the nature of scientific prediction. It is not, in general, sufficient to make point predictions without quantification of uncertainty. There is a very great difference between a point prediction (i.e. the most likely value) of a future observation being 10, and being confident that it will be between 9 and 11 – and on the other hand making a point prediction of 10 but judging that the outcome could be anywhere between 1 and 100. Certainly any decisions based on that central prediction could be very different, depending on which of these quantifications of uncertainty is made. Issues in quantifying and managing uncertainty are very different on operational and planning timescales. For instance, when operating an engineering system one accrues relevant data for model calibration, or constructing statistics of forecast error, relatively rapidly. On longer planning timescales (where one might be looking years or decades ahead) many more uncertainties enter the picture including imperfect knowledge of system background and technology development, and one accrues relevant historic data much more slowly – indeed for many purposes one might not have directly relevant historic data at all, and then a substantial degree of expert judgment is inevitably required to determine model inputs and quantify uncertainty in real-world predictions. As a consequence of the uncertain relationship between model outputs and the world, conventional ideas of single optimal solutions do not apply when thinking about the real world on planning timescales – the equivalent is being confident that a policy or decision will perform well in the real world, along with a systematic argument to support this. This is a good reminder that as modellers we should take a realistic and honest view of the strengths and weaknesses of our work, and certainly not take an unrealistic salesperson’s perspective. In the original Star Wars film, Tarkin and Motti did not recognise the weaknesses of their Death Star, and the consequences for them were not good. Specific issues to guard against in presenting one’s own work include justifying an approach as the best available or an industry standard (this does not necessarily mean that it is fit for the purpose at hand), and choosing performance metrics which unduly favour the chosen approach over others. The Roman poet Juvenal probably was not thinking of peer review processes when writing this line in his Satires – but nevertheless this quotation is very apt. The reliability of any peer review process is strongly dependent on how well the reviewers are selected and managed, and on the way in which the authors of a document act upon their comments. In addition, even the most appropriate reviewers will occasionally miss something or otherwise make a mistake. There are specific causes for concern in circumstances where the authors of a document or study (or their organisation) select the reviewers themselves (and sometimes pay them) – great integrity is then required on the part of all concerned, including willingness on the part of the organisation commissioning the review to regard a correctly negative review as being to their benefit. Another circumstance in which peer review can become unreliable is where a community is quite closed, and does not seek relevant expertise from other communities which have relevant knowledge. As an individual looking to understand others’ modelling studies, the safe course of action is to take one’s own judgment, rather than trusting entirely the authors or reviewers – of course some authors or forms of publication will be more worthy of trust than others. One must also understand that over time knowledge develops, so what was deemed best practice some years ago might not remain thus. In order for people to take their own judgment, a sufficient level of detail must be supplied to them by a study’s authors. This can be a serious issue in public policy debates, where sometimes quite limited detail of study methodology is placed in the public domain – it is then very hard for the modelling study to play a proper role in debate, as no one external to the organisation designing the study can critique it, and use of its conclusions by anyone external relies on a very high degree of trust. This great football manager talked about taking away his players’ false confidence and giving them true confidence based on a proper understanding of their abilities. Unfortunately, many studies at some point implicitly rely on an unsupported assertion that their results can say something meaningful about the world, in which case confidence in their use may be false. True confidence can be gained by having logical arguments about what the study can say regarding the real world, as discussed above. This article advocates an approach to energy systems modelling which is quite different from much current practice. The key, as noted above, is that where models are used in decision support it is necessary to have logical arguments regarding what the modelling says about the real world. A key part of this is deciding an appropriate level of detail in a given modelling study. Additional detail is typically added with an aim of learning more about the world, and there may well be a minimal level of detail below which the model cannot say anything about the real system. On the other hand, as the complexity of a model increases, it can become harder to assess what it is saying about the world – for instance quantifying uncertainty in predictions typically requires multiple model runs, with greater complexity implying a need for more runs but also making each run take longer. This necessary comprehensive analysis of model-real world relationship requires significant additional resource, and may also require quite different expertise from that needed to build a system model. In addition, it is necessary to confront explicitly the subjective judgments involved in determining model structure and model inputs. All this should be thought about right from the start of a modelling study, with the system modelling and uncertainty quantification being designed together, in order to maximise learning about the real world. Thus this analysis is not easy, but carrying it out will mean decisions can be based on the state of knowledge about the world, rather than about the model – and thus that better decisions based on modelling evidence are made. The author thanks colleagues (H. Du, B. Hobbs, A. Wilson and M. Winskel) who have commented on drafts of this article, and acknowledges discussions with many further colleagues which have helped shape the thinking which it contains. The views expressed are the author’s own, and should not be assumed to represent those of any other person or organisation (including the Galactic Empire). This is not a direct quote, but rather a combination of ideas expressed by its author. See http://quoteinvestigator.com/2011/05/13/einstein-simple/ for a quite scarily exhaustive investigation of this point. Similarly to Ben Hobbs, this is not a direct quotation. This is the first blog in the Energy & Society Network’s series responding to the Scottish Government’s Energy Strategy. By Dr Mark Winskel, Chancellor’s Research Fellow, School of Social and Political Science, University of Edinburgh. We are in an intense period of consultation on the Scottish Government’s draft energy strategy, and it’s proving to be a testing time for those academics seeking to offer ‘independent’ advice (both constructive and critical) to policymakers. The publication of the draft Energy Strategy and Climate Change Plan mark significant steps in policy formation in Scotland. Even though energy policy is still largely a reserved matter for the UK Government, and energy infrastructures are largely integrated at the GB-scale (socially as well as technically) the Scottish Government has had ambitions for an ‘integrated’ energy policy for some time, working across power, heat, transport and industry. To support this, the Government recently commissioned a whole energy systems model, known as ‘Scottish TIMES’ (TIMES being a widely used model type for energy policy support). While whole systems energy modelling is a departure for Scotland, it has a long track record in research and policy communities elsewhere. In the UK as a whole, for example, TIMES-type models have been used in research and policy groups for well over a decade, and were instrumental in analytical support for the UK Climate Change Act, through work carried out by the UK Committee on Climate Change (CCC) and the UK Energy Research Centre (UKERC), among others. The track record of whole systems modelling for policy support is mixed. As the Scottish Government notes in its draft Climate Change Plan, whole systems models are valuable because they force systematic consideration of the most affordable way of meeting policy targets across different sectors. In principle this should promote a more transparent, robust and publicly accountable form of policy making, but the Scottish Government has been criticised by the Scottish Parliament for a lack of transparency and detailed analysis, even compared to earlier versions of its climate plans. There are two big (and interrelated) problems here – one ‘technical and analytical’ and one ‘policy and political’. TIMES is the standard choice of energy policy support models because it combines breadth (economy-wide) and depth (it includes a detailed set of alternative technical options for meeting energy needs). This means it is also highly complex and difficult to understand, even for those closely involved. (I spent around three years working on a UKERC whole systems research project called ‘Energy 2050’ which used an earlier version of TIMES. Much of that time involved probing the inner-workings of energy system models and understanding the links between input assumptions and pathway outcomes). The Scottish Government has had only around half that time, from receiving the model from the consultants commissioned to build it, to publishing its draft plan and strategy. It has also faced the additional policy and political challenges of gaining agreement on its plan and strategy across different parts of government and numerous sectoral interests each keen to minimise disruption and maximise benefit, and of reconciling climate policy ambitions with other imperatives (the draft energy strategy’s list of policy drivers are – in order – growth, security, affordability and decarbonisation). Perhaps as a result the draft policy documents – while they affirm the Scottish Government’s high overall ambition on decarbonisation and low carbon technology deployment – are thin in terms of analytical detail and consideration of uncertainties and alternatives. The Climate Plan offers a single decarbonisation pathway to 2032, while the Energy Strategy wholly avoids integrated pathway analysis, instead highlighting ‘the range of technologies and fuels that will supply our energy needs over the coming decades’ (the focus here on supply-side technical matters is itself a stepping-back from a holistic view). I wrote elsewhere about some of my more specific concerns about the Climate Change Plan. Here I note some more general challenges for independent researchers in seeking to contribute to energy policy debate and formation in Scotland. (By ‘independent’ here, I mean those of us working in the academic sector, whose research is supported mostly by public money; there are many other interest-groups feeding into the policy process, but as independent academics we have a particular role to consider the range and balance of evidence on difficult policy areas). I often describe myself as an independent academic, and my main research organisation over the past decade, UKERC, defines itself as a centre for independent research, as does the CCC. Fulfilling that role has become harder recently, as energy policy has become increasingly contested and political consensus weakened in some countries. Offering an independent voice means being prepared to ask difficult questions to policy makers, and testing-out and challenging knowledge claims held by others seeking to influence policy. There is evidence that this challenge role is important for good governance, but alongside confident advocates of solutions it can feel like a pessimist’s version of the future. (Though a recent UK Parliament Committee pointed out the high cost of appraisal optimism in recent energy policymaking). This all suggests the need to consider the institutional arrangements for research-policy exchange. Effective policy is unlikely to emerge from opaque deals – we need robust exchange and challenge, even on difficult areas. The UK Government currently stands accused of policy opacity, as energy policy seemingly becomes a branch of industrial strategy and clean growth, with a ‘policy gap’ between where an evidence-based energy policy should be and the reality, yet the CCC has proven a largely effective means of independent analysis and advice to government since 2008. The CCC has a less formal advisory role in Scotland, and there is a lack of strong independent and integrative analytical capacity on energy and climate change in Scotland, despite recent efforts by ClimateXChange, among others. The draft Climate Change Plan suggests setting up a new expert advisory body. Evidence-based whole systems policymaking will always be frustrated by the realities of political and other interests, but as Scottish energy policy and research communities mature, a strengthened independent analytical base will be essential to meet the technical and political challenges ahead. The Global Environment and Society Academy (GESA) is a network of experts collaborating to develop innovative solutions for the world’s most challenging problems. Led by Professor Dave Reay and Professor Elizabeth Bomberg GESA operates as one of four University of Edinburgh Academies, including Global Health, Global Justice and Global Development. The Academies were developed to find innovative solutions by bringing together experts from many different academic fields. 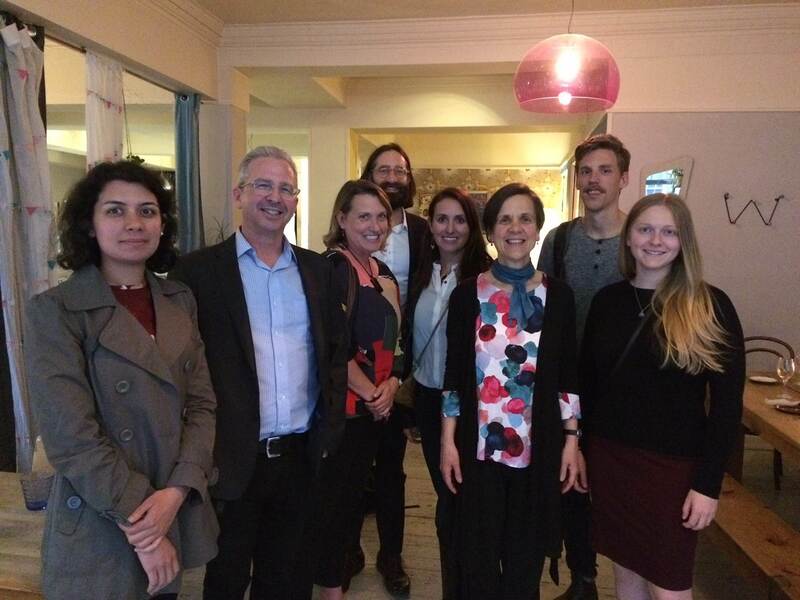 An interdisciplinary network, we have faculty and student members with teaching responsibilities and research interests in environment and society from across Geosciences, Informatics, Law, Art, Landscape Architecture, Business and Education.